If your group is planning to visit the museum outside of regular operating hours, you must contact us to make a reservation. See the section below that best describes your group. The museum does not require reservations for groups that visit during regular operating hours, however large groups should call ahead to let us prepare for your arrival. The museum has a special program to accommodate various groups outside of our regular hours. Note that winter operation is dependent on weather and snow cover, and early spring operation may be limited by track work. Contact us to check that your plans will work with our schedule. 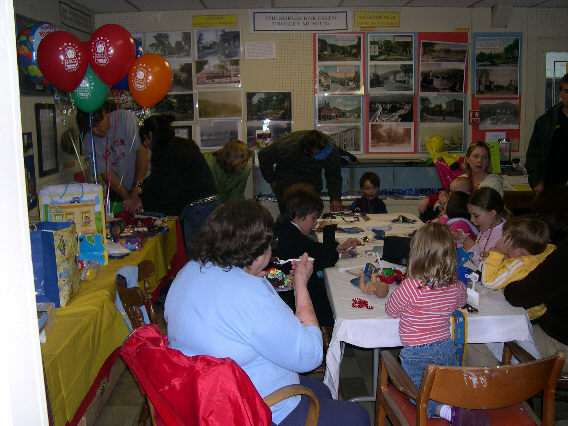 Birthday Parties - For a fixed fee we provide a space for the party in our museum (picture), complete with Brio and Lionel trains and coloring books and supplies, or you can use our caboose! You supply the food and refreshments and party favors, and decorate as you choose. We provide trolley car rides (and pump car rides if the children are old enough) for the first two hours and a free gift for the birthday child. If you have your party when we are not otherwise open, the place is yours for three hours. During regular hours, you may need to share the rides and toy trains with our other guests. Other parties can also be easily accommodated. See the Group Reservation Form for applicable fees. Visit TrainParty.com for ideas and items for a train-themed birthday party. School Field Trips - As part of our educational mission, the museum encourages school groups of any age to visit the museum, see the photographs of trolley and railroad activities in the area, explore the equipment, ride the trolley, hear about the history and technology of trolleys and railroads, and ask questions. We are in the process of developing more participatory school oriented activities such as having children play the roles of workers, shippers, passengers and merchants along the line of the Shelburne Falls and Colrain Street Railway. See the Group Reservation Form for applicable fees. Bus Tours, Senior and Social Groups - We will provide admission to the grounds, complete tours, trolley rides, photo opportunities and answer your questions about railroads and trolleys. Easy bus parking is available in the yard. Our trolley car and Visitor Center and rest rooms are fully accessible. See our Group Reservation Form for applicable fees. Contact us to check that your plans will work with our schedule. Fill out our Group Reservation Form and mail it to us with your deposit check.